Using a transgenic approach, we analyzed the contribution of introns located within the IFN-γ gene and distal regulatory regions to IFN-γ gene expression. Intron 1 and 3 from the IFN-γ gene displayed strong enhancer activity. This activity appeared to be dependent upon integration into the genome but resulted in a loss of Th1 selectivity. We also found that distal regulatory elements are not required for high level expression of the human IFN-γ gene, but rather for cell lineage-specific expression. An 8.6-kb human IFN-γ transgene was sufficient to yield high level expression but a 191-kb IFN-γ transgene with ∼90 kb of flanking 5′ and 3′ sequence was necessary to achieve both high level and Th1 selective expression of human IFN-γ. Interferon-γ plays a critical role in host defenses against infection by pathogenic organisms. This cytokine is produced by cells of the innate immune system, such as NK cells or invariant TCR+, NK1.1+, T cells, as well as by cells of the adaptive immune system, Th1 (CD4+) or T cytotoxic (Tc)3 1 (CD8+) cells (1, 2, 3). Overexpression or inappropriate expression of IFN-γ appears to be a contributory factor to the development of autoimmune diseases (4, 5). The transcription factor T-box expression in T cells (T-bet) is expressed predominantly in Th1 cells and stimulates IFN-γ gene expression and Th1 development (6, 7). GATA-3, expressed predominantly in Th2 cells, is critical for Th2 lineage development (8, 9, 10). Both act as transactivators, can induce DNase I hypersensitivity changes in cytokine genomic loci, and possess negative regulatory functions; GATA 3 inhibits IFN-γ expression, and T-bet inhibits Th2 cytokine expression (6, 11, 12, 13). The approach of DNase I hypersensitivity mapping has been used successfully to localize genomic regions functionally linked to gene regulation (14, 15). Chromatin remodeling of cytokine gene loci occurs during Th cell differentiation (16). Different DNase I hypersensitivity sites may be either lineage specific or nonspecific. For example, certain DNase I hypersensitivity sites found in Th1 or Th2 cytokine genes are open only in Th1 or Th2 cells, respectively, while others are open in both Th1 and Th2 cells (17, 18). In the IL-4 gene, both intergenic and intragenic DNase I hypersensitivity sites have strong transcriptional enhancer activity. However, the combination of several DNase I hypersensitivity sites is required to achieve both high level and Th2-specific expression of a reporter gene (19). In this study, using a similar approach, we searched for distal regulatory elements that control expression of the IFN-γ gene. We generated a series of reporter transgenic mice that contained the luciferase gene under the control of the 5′ (−565 to +64 bp) human IFN-γ promoter alone, or with intron 1, intron 3, or intron 1 + intron 3 of the IFN-γ gene. We found that the introns displayed strong enhancer activity but resulted in a loss of Th1 selectivity. We also generated transgenic mice containing the human IFN-γ gene as either an 8.6-kb or 191-kb fragment of genomic DNA. Surprisingly, only human IFN-γ derived from the 191-kb transgene was produced at high levels and was selectively expressed in Th1/Tc1 cells. These results demonstrate that, as is the case for Th2 cytokine genes, distal regulatory regions are required for Th1/Tc1 selective expression of the IFN-γ gene. The −565 to +64, intron 1 (1240 bp) and intron 3 (2425 bp) regions from the human IFN-γ gene were amplified by PCR from a plasmid containing the 8.6-kb complete human IFN-γ gene. 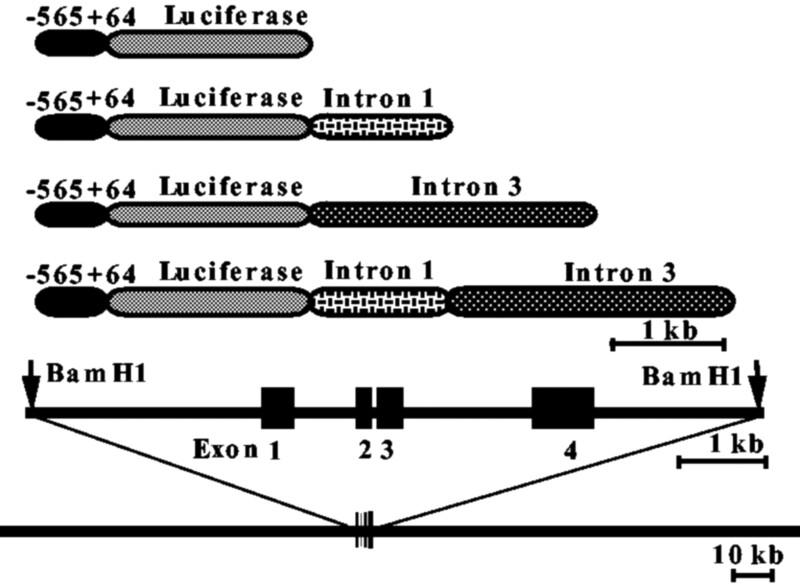 The (−565 to +64 bp) IFN-γ-luciferase construct was prepared by inserting the 628-bp promoter region from −565 to +64 into the XhoI and HindIII sites of the luciferase plasmid. We inserted a polylinker into the SacI and KpnI sites of the (−565 to +64 bp) IFN-γ-luciferase plasmid located 3′ of the luciferase gene. Intron 1, intron 3, or both introns 1 and 3 were inserted into this 3′ site (see Fig. 1⇓). The reporter constructs containing the IFN-γ promoter, luciferase gene, and introns were isolated after digestion with HpaI, purified, and injected into fertilized eggs of B6D2. Transgenic mice were generated as previously described (20). We also made transgenic mice containing the human IFN-γ gene as either an 8.6- or 191-kb fragment of genomic DNA. The plasmid containing the 8.6-kb human IFN-γ gene was a gift from H. Young (National Cancer Institute, Frederick, MD). The 191-kb BAC containing the human IFN-γ gene was purchased from Invitrogen (Accession no. AC007458, BAC RPCI11-444B24; Carlsbad, CA). Transgene-positive mice were identified by PCR analysis using tail DNA and primers selective for the luciferase or human IFN-γ genes. Schematic representation of different reporter constructs used to prepare transgenic mice. Spleen cells were harvested from wild-type or transgenic mice (4–6 wk of age). CD4+ and CD8+ T cells were purified by negative selection, essentially as previously described using anti-Ia mAb, anti-NK cell mAb (NK 1.1; American Type Culture Collection, Manassas, VA) and either an anti-CD8 mAb (TIB 105; American Type Culture Collection) or an anti-CD4 mAb (GK 1.5; American Type Culture Collection). Labeled cells were removed using goat anti-mouse or anti-rat IgG bound to magnetic beads (Genome Therapeutics, Waltham, MA). The average purity of CD4+ or CD8+ T cells was ∼90–95% as determined by flow cytometry. RBC-depleted splenocytes from C57BL10 mice were depleted of CD4+ and CD8+ T cells by negative selection with anti-CD4 and anti-CD8 mAb and were irradiated at 3000 rad from a cesium 137 source and used as APCs. Reagents used to stimulate T cells were: anti-CD3 mAb (145-2C11 clone; American Type Culture Collection); IL-4, 5 ng/ml; or IL-12, 5 ng/ml. Recombinant murine IL-4 and IL-12 were purchased from BD PharMingen (San Diego, CA). Immobilized anti-CD3 mAb was prepared by standard methods. Murine and human IFN-γ ELISAs were performed with Abs from BD PharMingen according to the manufacturer’s procedures. Cells were cultured in complete RPMI 1640 medium with 10% FCS, 100 U/ml penicillin, 100 U/ml streptomycin, 2 mM l-glutamine, and 5 × 10−5 M 2-ME in 24-well tissue culture plates in a volume of 1 ml at a density of 1 × 106/ml with stimuli as described in the text at 37°C in 5% CO2 in air. Syngeneic irradiated APC were used at a density of 1 × 106/ml of culture fluid. T cells were stimulated with plate-bound anti-CD3 mAb and APC for 5 days under neutral condition (no further additions), Th1 conditions (5 ng/ml IL-12 and 10 μg/ml anti-IL-4 mAb), or Th2 conditions (5 ng/ml IL-4 and 10 μg/ml anti-IFN-γ mAb). Cultures were harvested and restimulated with plate-bound anti-CD3 mAb for an additional 48 h.
Cultures were harvested, washed twice in PBS, and suspended in 50 μl of lysis buffer (Promega, Madison, WI) for 30 min at 20°C. Aliquots of supernatant fluids were assayed for luciferase activity with 100 μl of Luciferase Reagent (Promega) in a luminometer (TD20/20; Turner, Palo Alto, CA) for 15 s. Cultures were performed in duplicate. Duplicate analyses of two aliquots from each cell lysate were performed and the results were averaged. Results are expressed as the average of these readings per 106 cells with the SE. The background measurement with luciferase reagent alone was subtracted from each reading. Results are expressed in relative light units (RLU). Experiments were performed a minimum of three times. The T-bet expression vector was obtained from L. Glimcher (Harvard University, Boston, MA). Jurkat cells, in log phase growth, were harvested and transfected with various plasmids as outlined in the text using Lipofectamine 2000 Reagent (Invitrogen, San Diego, CA) according to the manufacturer’s protocol. After a rest period of 24 h, cultures were left unstimulated or were stimulated with PMA (50 nM) and ionomycin (1 μg/ml). After overnight culture (peak of the response), cells were harvested and equivalent numbers of viable cells were analyzed for luciferase activity. Previously, we produced and characterized a series of reporter transgenic mice that express the luciferase gene under the control of various regions of the 5′ human IFN-γ promoter. In this study, we wanted to determine whether distal regions of the IFN-γ gene contained regulatory activity. To do so, we took two approaches. First, we generated a series of reporter transgenic mice that contained the luciferase gene under the control of the 5′ (−565 to +64bp) human IFN-γ promoter alone, or with intron 1, intron 3, or intron 1 + intron 3 of the IFN-γ gene, inserted 3′ of the luciferase gene. Second, we prepared transgenic lines that contained only the 8.6-kb human IFN-γ gene or a 191-kb human genomic fragment (BAC clone) with the human IFN-γ gene at position 91 to 96 kb of the clone (Fig. 1⇑). To determine whether either intron 1 or intron 3 of the IFN-γ gene regulated promoter activity, we stimulated CD4+ and CD8+ T cells from the different luciferase reporter lines under neutral, Th1 (Tc1), or Th2 (Tc2) differentiation conditions. After 5 days, cultures were harvested and restimulated with anti-CD3 mAb. At different times after the primary and secondary stimulations, cultures were harvested and analyzed for luciferase activity. 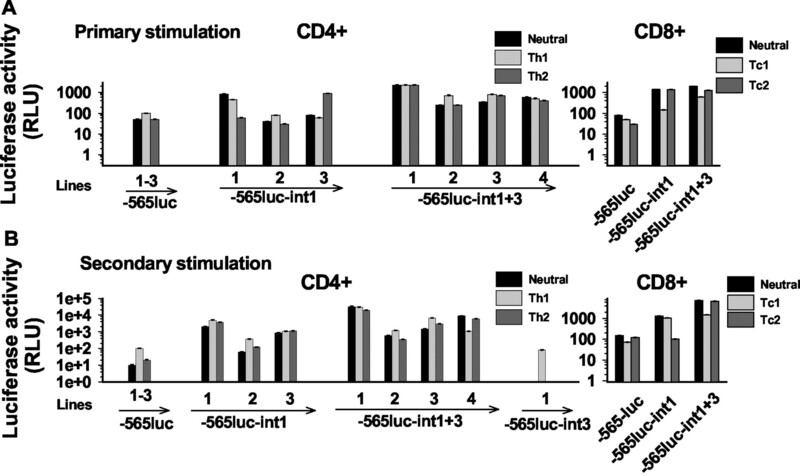 Levels of expression by CD4 and CD8 T cells from these lines were compared with the mean of three (−565 to +64 bp) luciferase lines that display Th1-selective activity (21). 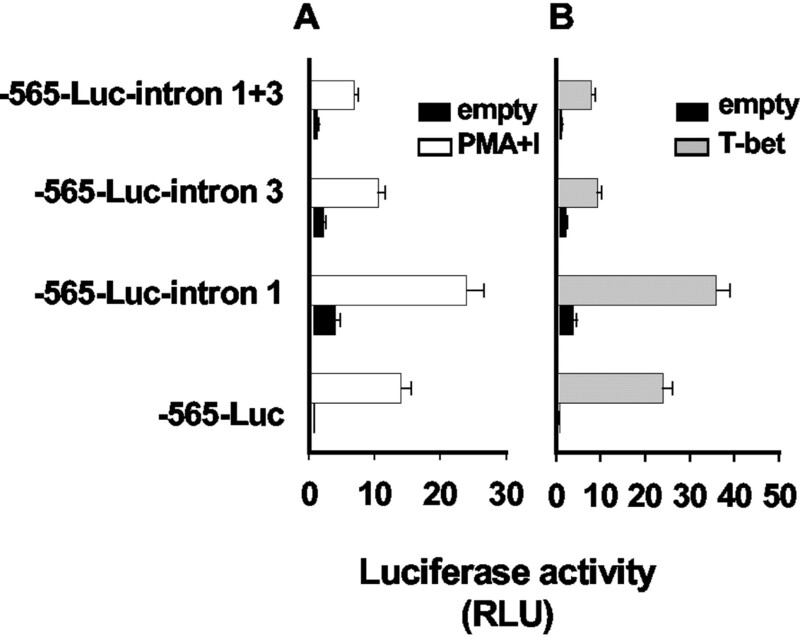 Overall, lines containing either the (−565 to +64 bp)-luciferase-intron (−565-luc-int) 1 or −565-luc-int 1 + 3 transgene displayed greater activity in primary cultures than lines containing the −565-luc transgene (Fig. 2⇓A). Lines containing the −565-luc-int 1 + 3 transgene displayed greater activity than −565-luc-int 1. However, this increase in transcriptional activity resulted in a loss of specificity and T cells differentiating under neutral conditions; Th1 or Th2 conditions expressed similar levels of luciferase activity. These data suggest that both the first and third introns of the IFN-γ gene contain enhancer activity but that it is relatively Th1 nonspecific. In general, similar results were observed after secondary stimulation of effector T cells that had differentiated under neutral, Th1 (Tc1), or Th2 (Tc2) conditions (Fig. 2⇓B). The major difference was in the magnitude of the response. The −565-luc-int 1 lines exhibited a 5- to 50-fold increase in transcriptional activity while −565-luc-int 1 + 3 lines exhibited a 10- to 200-fold increase in overall activity compared with the −565-luc lines. This increase in activity was, for the most part, not Th1 or Tc1 selective. We only obtained one −565-luc-int 3 line so it is difficult to make conclusions concerning the enhancer activity of intron 3 from these results. Nevertheless, we did not observe an increase in activity in the −565-luc-int 3 line as we did in each of the −565-luc-int 1 and −565-luc-int 1 + 3 lines compared with the −565-luc lines. These data clearly show that intron 1 of the IFN-γ gene contains enhancer activity. They also suggest that introns 1 and 3 may act cooperatively to enhance IFN-γ promoter activity. Considering these data, it is likely that introns 1 and 3 contribute to the overall expression of the IFN-γ gene. These data also suggest that there are additional regions that are necessary to achieve both selective and high level expression of the IFN-γ gene in Th1 (Tc1) cells. Introns from the IFN-γ gene exhibit transcriptional enhancer activity. 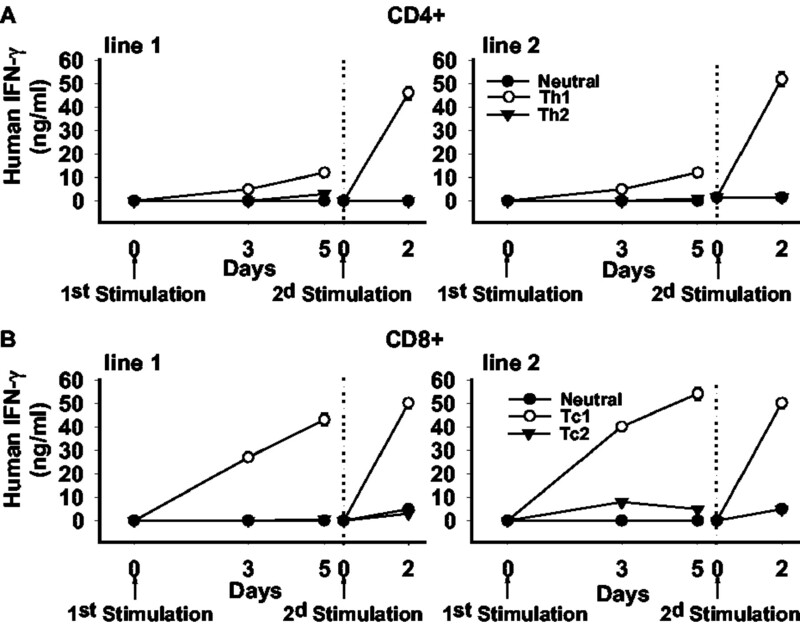 CD4+ and CD8+ T cells from the different luciferase reporter lines were stimulated under neutral, Th1 (Tc1), or Th2 (Tc2) differentiation conditions. After 5 days, cultures were harvested and restimulated with anti-CD3 mAb. Cultures were harvested (A) 3 days after primary stimulation or (B) 2 days after secondary stimulation and analyzed for luciferase activity. Results are expressed as the mean of triplicate samples ± SEM. Results from the −565-luc lines are the mean ± SEM of three lines derived from independent founders. The next questions we wanted to address were whether intron 1 or intron 1 and 3 displayed enhancer activity in transient transfection assays and whether T-bet affected promoter/enhancer activity. In transient transfection assays with Jurkat cells, we did not find strong activation-dependent enhancer activity by linking intron 1, intron 3, or introns 1 + 3 to the 3′ end of the −565-luc construct as we observed in the transgenic lines (Fig. 3⇓A). In transient transfection assays, T-bet is a strong transactivator of the IFN-γ promoter (21). We also wanted to determine whether T-bet would provide greater transactivation if the IFN-γ gene introns were linked to the IFN-γ promoter-luciferase construct. We did not observe greater T-bet-dependent transactivation of the promoter-intron constructs than obtained with the promoter alone (Fig. 3⇓B). These data suggest that the enhancer activity contributed by introns 1 + 3 is dependent upon integration into the genome. Alternatively, additional nuclear factors that drive enhancer activity may not be present in Jurkat cells. These data also suggest that additional T-bet responsive elements are not located in IFN-γ introns. Introns do not display enhancer activity in transient transfection assays. A, Jurkat cells were transfected with different reporter constructs. After 24 h, transfected cells were stimulated with PMA and ionomycin and cultures were harvested and analyzed for luciferase levels after an additional 24 h. B, Jurkat T cells were transfected with the indicated reporter constructs and either empty vector or a T-bet expression vector. After 48 h of culture, cells were harvested and analyzed for levels of luciferase. Results are expressed as the mean ± SEM of two experiments. The next step in our investigation was to test the production of human IFN-γ protein in lines of transgenic mice containing the human IFN-γ gene as either an 8.6-kb or 191-kb fragment of genomic DNA (see Fig. 1⇑). In primary cultures, T cells from transgenic mice containing the 8.6-kb human IFN-γ gene (line 1) produced very low levels of human IFN-γ (∼10 ng/ml) when cultured under neutral conditions and undetectable levels of human IFN-γ when cultured under either Th1 or Th2 conditions (Fig. 4⇓A). In the second line derived from an independent founder, production of IFN-γ was high in T cells cultured under neutral, Th1, or Th2 conditions. A similar pattern was observed after secondary stimulation, neutral Th ≫ Th1 = Th2 for line 1, and neutral Th = Th1 = Th2 for line 2. We also analyzed a third line derived from a separate founder that had similar characteristics to line 2 (not shown). Cultures of CD8 T cells yielded similar lack of selectivity in Tc1 cells as observed in effector Th1 cells (Fig. 4⇓B). The maximum amount of human IFN-γ found in these cultures (50–150 ng/ml) was comparable to that of murine IFN-γ found in Th1 or Tc1 cultures (150–250 ng/ml). The presence of the human IFN-γ transgene or human IFN-γ in cultures had no effect on the selective production of murine IFN-γ found in either Th1 or Tc1 cultures. Production of human IFN-γ protein in two independent lines of transgenic mice containing the 8.6-kb human IFN-γ gene. CD4+ (A) and CD8+ (B) were cultured for 5 days as described and restimulated with anti-CD3 for 2 days. Levels of human IFN-γ were measured in cultures by ELISA. The results are expressed as the mean ± SEM of quadruplicate cultures. In contrast to results with the 8.6-kb human IFN-γ transgenic lines, we found that transgenic CD4+ T cells from two independent founder lines containing the 191-kb fragment of genomic DNA with the human IFN-γ gene produced human IFN-γ in a Th1-selective manner in both primary and secondary cultures (Fig. 5⇓A). In primary cultures, CD4+ T cells cultured under Th1 conditions produced 12 ng/ml human IFN-γ compared with 2 or 0.3 ng/ml when cultured under Th2 or neutral conditions, respectively. In secondary cultures, the level of human IFN-γ was ∼50 ng/ml in cultures under Th1 conditions and <0.2 ng/ml in cultures under either neutral or Th2 conditions. As above, the presence of the human DNA transgene and production of human IFN-γ did not alter production of mouse IFN-γ in these cultures. Typically, cultures of wild-type CD4 T cells and transgenic T cells contained 10–20, 100–200, and 3–10 ng/ml murine IFN-γ after secondary stimulation following culture under neutral, Th1, or Th2 conditions, respectively. Production of human IFN-γ protein in two independent lines of mice that contain the 191-kb human IFN-γ transgene. CD4+ (A) and CD8+ (B) were cultured for 5 days and restimulated with anti-CD3 for 2 days. IFN-γ levels were measured in cultures by ELISA. Results are expressed as the mean ± SEM of quadruplicate cultures. 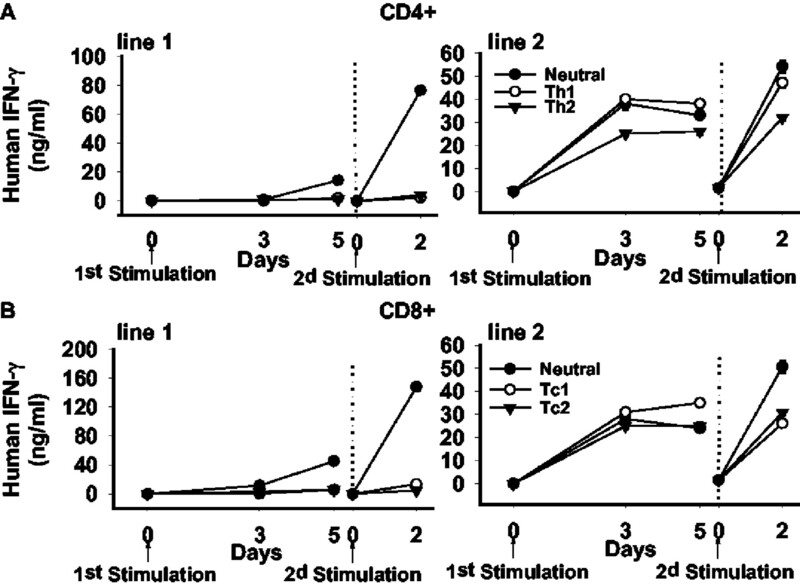 CD8+ T cells were also tested under similar culture conditions (Fig. 5⇑B). Levels of murine and human IFN-γ production were measured in cultures of T cells from two independent founder lines following activation under neutral, Tc1, or Tc2 conditions. In transgenic mice containing the human 191 genomic transgene, the production of human IFN-γ was Tc1-specific and the level of human IFN-γ was increased by >50-fold in primary and secondary Tc1 cultures compared with neutral (Tc0) or Tc2 cultures (Fig. 5⇑B). Overall, these results demonstrate that additional information outside of 8.6 kb of the human IFN-γ gene is necessary to achieve selective IFN-γ expression in Th1 and Tc1 cells and that this information is contained within the 191-kb genomic DNA fragment. In conclusion, our data on regulation of selective IFN-γ gene expression in Th1/Tc1 cells bear striking similarities to selective regulation of IL-4 gene expression in Th2 cells. First, both genes have a minimal 5′ promoter that confers either Th1 or Th2 selectivity but low overall activity (21, 22). Introns in both genes exhibit strong enhancer activity. This enhancer activity appears to be dependent upon integration into the genome. Finally, distal regulatory elements are required to achieve selective expression of IFN-γ in Th1/Tc1 cells and IL-4 in Th2 cells. Our results suggest that these distal regulatory elements are not required for high level expression of the IFN-γ gene. This is based upon the observation that similar amounts of human IFN-γ are produced in T cells containing either the 8.6-kb human transgene or the 191-kb transgene. The difference between these two transgenes is that the 191-kb transgene is required to achieve Th1/Tc1 selective expression. This is in contrast to the IL-4 gene where these distal regulatory elements appear to be required for both high expression and Th2-selective expression (19). ↵1 This work was supported by National Institutes of Health Grant AI 44924. The transgenic core facility was supported in part by National Institutes of Health Center Grants CA 68485 and DK20593. ↵3 Abbreviations used in this paper: Tc, T cytotoxic cell; T-bet, T-box expression in T cell. Hogan, B., F. Contantini, E. Lacy. 1986. Manipulating the Mouse Embryo: A Laboratory Manual Cold Spring Harbor Laboratory, Plainview.